London -based start-up OneWeb is set to launch the first six satellites in its multi-billion-pound project to take the internet to every corner of the globe. Wednesday’s launch on a Soyuz rocket from French Guiana is timed for 18:37 local time (21:37 GMT). 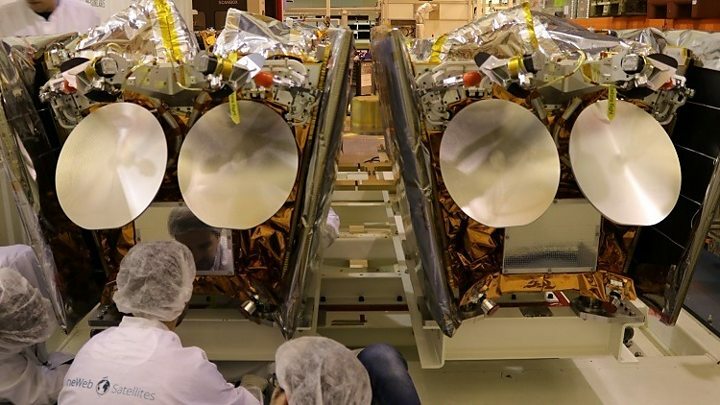 Controllers at OneWeb’s HQ in the UK capital will be waiting to pick up signals from the spacecraft when they come off the top of the Russian vehicle. The platforms’ most important task is to secure the frequencies needed to relay the coming networks’ internet connections. Assuming these pathfinders perform as expected, OneWeb will then begin the mass rollout of the rest of the constellation towards the end of the year. “We have a tonne of spectrum and we have it everywhere on Planet Earth,” explained OneWeb CEO Adrian Steckel. “We’re going to connect lots of people who’re not currently connected. We’re going to start by focussing on connecting schools, connecting boats, connecting planes, and connecting huge swathes of the planet that don’t make sense for fibre,” he told BBC News. He’d previously founded another constellation called O3b, which stands for “other three billion” – a reference to that half of the planet without connectivity. The HQ has a satellite control room, although this function is replicated in the US as well.